Indonesia’s parliament recently passed a controversial legislative amendment that bans public criticism of the government. The law, known as MD3, highlights a growing problem with the lack of accountability for Indonesian politicians. It will harm the administration’s reputation for tackling corruption, and raise questions about its commitment to, and ability to implement political reform. 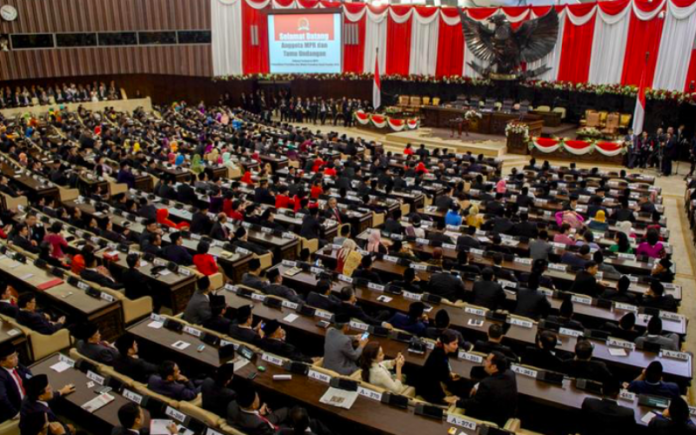 Last month, Indonesia’s House of Representatives (DPR) passed a controversial amendment to the 2014 Legislative Institutions Law, known as MD3. The amendment enables Parliament’s ethics council to bring charges against individuals or organisations that ‘disrespect the dignity of the House or its members’. Effectively, this law will protect Indonesian politicians from public criticism. Similar legislation is a regular sight in Southeast Asia, with strict laws already operating in Cambodia and Thailand. Having been met with strong opposition from Indonesia’s middle class, the bill is a risk for the coalition’s support and to its moderate, business-friendly reputation. With elections looming, questions will be asked over the government’s ability to curb the dominant, regressive trends that increasingly shape Indonesian politics. MD3 was allegedly proposed to protect politicians from ‘false allegations’, whether concerning corruption or related activities. Like a lot of free speech legislation in Southeast Asia, the wording is deliberately vague, open to interpretation, and risks instilling a chilling effect over public discourse. For example, the notion of ‘disrespect’ is not given sufficient clarification, and the form of punishment to offenders is not elucidated. The general consensus is that MBD will be exploited to curb the power of investigators working for Indonesia’s Corruption Eradication Commission (KPK). KPK is a powerful institution that has targeted key Indonesian politicians over recent years. Just last month, KPK charged the head of the Golkar political party, Setya Novanto, with 16 years in prison for graft. A 2012 survey found that Indonesia’s parliament was perceived as the country’s most corrupt institution, a view that continues to this day. Whether or not related to accusations of corruption, MD3 will provide a channel for stifling legitimate government criticism. In the long term, MD3 risks being exploited to target journalists, social activists or ordinary citizens expressing discontent with government policy. For Dahnil Anzar Simanjuntak, chairman of the Muhammadiyah Youth Leadership Center, Indonesia is headed ‘towards a dark era of democracy’. and dissemination of defamatory anti-government material. Furthermore, over 200 citizens have been prosecuted for defamation under the 2008 Electronic Information and Transaction Law – a law originally aimed at combatting cybercrimes and enforcing cybersecurity. Together, these laws point to the growing suppression of free speech in a country formerly on a moderate path. They represent significant obstacles for journalists wishing to publish exposés on government mishandling. Continuing along this route will force investors to reconsider the reputational risk of doing business, particularly if corruption is allowed to go unchallenged. House Speaker Bambang Soesatyo and Deputy House Speaker Fadli Zon were powerful figures supporting MD3. But the amendment has received broad backing, supported by 8 of Indonesia’s 10 ruling coalition parties. This includes the party of President Joko ‘Jokowi’ Widodo, Indonesian Democratic Party for Struggle (PDI-P) – although Jokowi has refused to sign off. This is considered a purely symbolic move, for his signature is not required to validate the legislation. Jokowi claims he was unable to prevent the amendment from becoming law by not been briefed on the legislative process. However, an extensive dialogue on the amended legislation between the government and DPR representatives was likely conducted. The DPR is not empowered to make laws by itself but according to Article 20(2) of the constitution, they require joint approval from the President or from one of his representatives. In the case of MD3, said representative was Law and Human Rights Minister Yasonna Laoly. New Mandala finds Jokowi’s claim that Laoly did not report to him during the bill’s deliberation as implausible. Laoly would be violating the constitution by acting without presidential authority – a gross dereliction of duty and a fireable offence. The same can be said for Jokowi’s advisers, who failed to follow and advise Jokowi on this major political development. Human rights activists criticised Jokowi’s administration for not taking decisive action during the drafting and revision process. However, this misses the point as Jokowi likely understood the impact that this legislation will have, but realised he was on politically sensitive ground. As the 2019 general election nears, political momentum must be maintained. With 8 out of 10 coalition parties supporting MD3, Jokowi is unlikely to risk his support for candidacy by acting against the bill. The removal of key Jokowi ally, Ahok, from his Jakarta governorship last year, provided a stark reminder of what can happen when politicians are not perceived to toe the line. On the other hand, such a legislative change is a risk for Jokowi’s public support going into the election, further undermining public trust in the DPR and Jokowi’s ability to influence meaningful reform. A Change.org petition calling for MD3’s removal has over 224,000 signatures and is the largest online petition in Indonesian history. It is supported by a host of civil society organisations, including Indonesia Corruption Watch (ICW), the Legislative Monitoring Committee (KOPEL) and the Indonesian Legal and Policy Studies Foundation (PSHK). Criticism of the bill encouraged a wave of protests, reflecting a growing educated middle class concerned about the democratic rollbacks happening under Jokowi’s watch. Given an unchanged situation, demonstrations will likely escalate before next year’s election. The ‘millennial’ political party, Indonesian Solidarity Party (PSI), and bands of disgruntled university students and other activists will be the key drivers behind these demonstrations. PSI is among several organisations that have lodged a judicial complaint with Indonesia’s Constitutional Court – following the government’s own advice. Nevertheless, with strong backing across the political spectrum, the court is unlikely to intervene and the government advice will be viewed as hollow. However, this whole debacle will raise questions over Jokowi’s moderating influence over national politics. He has been at the helm of some controversial policies and his administration is increasingly veering to the right, losing support from the centre. Indonesia is due for a turbulent election year as the middle class challenge the government to address their growing concerns over national politics.